Did you know that you can now check out library books from the Elgin Mall? The Library Lending Kiosk works like a vending machine, but instead of bottled drinks or a snack, the unit dispenses library books! All you have to do is enter your library card, and select the title you want. The book drops down, and you can take it home with you for 3 weeks! What books can you choose from? Check out the many titles available! How often are the books changed? We replace titles and add new ones every few months! Check back often, as there may be something new! Why did the Library choose the mall? Back in 2011, the library operated day-to-day out of the mall, during its year-long building renovation. Library customers really liked having a presence at the mall, and patrons have told us that they miss having us there. So what better place to try and reach more library customers, who may not be able to visit our main location on Curtis Street! How are the Friends of St. Thomas Public Library involved? The lending kiosk was generously sponsored by the Friends of the Library group, and they happen to run a used book shop in the Elgin Mall already. 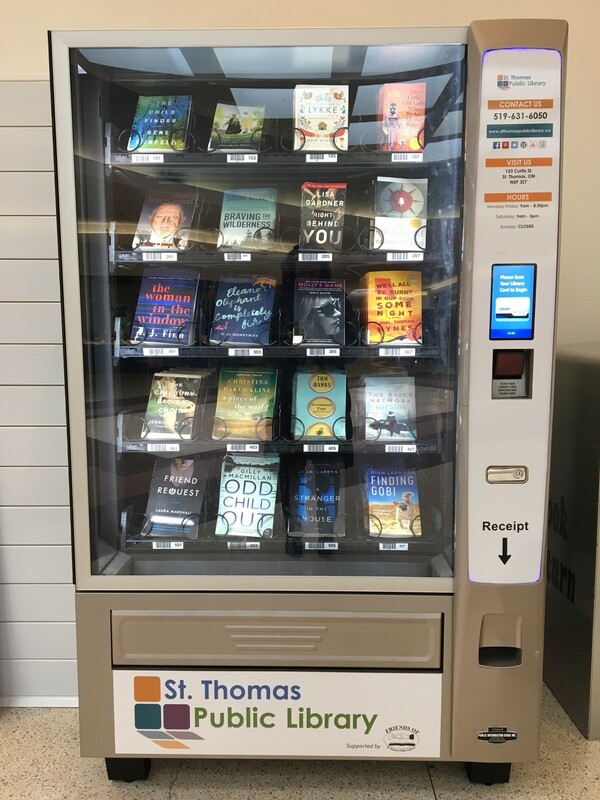 The Friends of St. Thomas Public Library are volunteers who have donated over $200,000 to the Library since their inception in 1994, and they were so pleased to have been able to donate the funds for this exciting project.